This project University Bulletin Board has been developed on PHP and MySQL. We are providing php online projects with source code for student purpose. 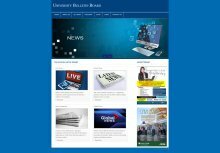 The main objective of this project University Bulletin Board Project in php manages the information about the University News such as News Category, News Comments, News, Class, System State etc. It can also manage to keep all the record of Previous University News. This project provides a lot of features to manage the products in very well manner. This project contains a lot of advance modules which makes the back end system very powerful. We can develop simple php mysql project code for students who want to use php online projects for learning. We can also develop latest project topics in php mysql project.